Welcome to the Zoo's media page, where you can find information on all digital inquiries and latest happenings at the Zoo. For image requests, please contact our Public Relations & Digital Communications Specialist. Please send all media and digital requests. Please send all marketing and paid advertising requests. View the Zoo’s Privacy and Copyright policy regarding images, documents, etc. All media inquiries should be directed to the Zoo’s Public Relations & Digital Communications Specialist. Photos taken for private, personal use are welcome. Taking photos or video for commercial purposes, including stock images, commercial products or purposes is strictly prohibited. Complimentary admission can be arranged for media professionals. The more lead time we have, the more available opportunities we may have. We will request links or copies of all published articles, photographs, or videos. Behind-the-scenes coverage is prohibited unless otherwise arranged in advance. All imaging equipment must remain in public areas and not cross into animal habitats. We reserve the right to deny and request or cancel any shoot if at any time it is not in the best interest of the animals, visitors, or does not align with the Zoo’s mission. The Central Florida Zoo & Botanical Gardens’ policy requires all media requests to be screened by our communications department. For breaking news or developing stories, media representatives are asked to contact 407-323-4450 ext. 105 to schedule filming opportunities and interviews. To be added to our press release contact list, please send a request to communications@centralfloridazoo.org. We understand the nature of minute-by-minute news and will try to accommodate all stations as possible. Permission is required for all photo and video obtained for commercial purposes on Central Florida Zoo & Botanical Gardens’ grounds. This includes all property past the front entrance off of West Seminole Boulevard including, but not limited to—the train, carousel, Seminole Aerial Adventures, Wayne M. Densch Discovery Center, and the entirety of the Zoo. The Zoo reserves the right to determine acceptable requests and appropriate use of any content obtained on premises. All content must uphold the Zoo’s mission and respect our facilities, animals, staff, visitors, and overall Zoo image. You must make a request at least two weeks in advance so a member of the communications team can accompany you during your visit. Please contact us with specific details of your request and affiliation. The Central Florida Zoo & Botanical Gardens has a variety of aesthetically desirable locations for professional photography. All photo shoots are subject to fees and must be scheduled with our events manager. If you are looking to book a photoshoot on our property, please contact our events team at 407-323-4450 ext. 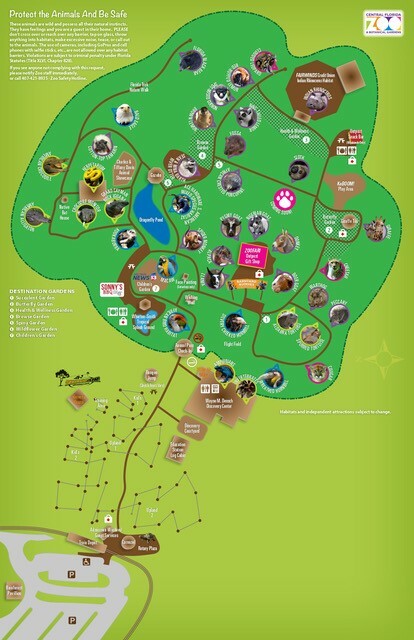 103 or events@centralfloridazoo.org. Students interested in conducting interview, photo, or video projects at the Central Florida Zoo & Botanical Gardens must request permission through the Zoo’s Public Relations & Digital Communications Specialist. We believe in the value of education and will try to accommodate academic requests, however, depending on staff availability, not all requests can be approved. You must make a request at least two weeks in advance so a member of the communications team can accompany you during your visit. Please contact us with specific details of school, course, project, and deadline. Include requests about interviews, specific animals, etc. If your proposed content is approved, the Central Florida Zoo & Botanical Gardens will provide up to two complimentary single-day admission tickets to the Zoo or the course of your choice at Seminole Aerial Adventures. Complimentary tickets will be only valid on weekdays (Monday–Friday) and will be provided no more than once in a 12-month period per writer/influencer. We encourage guests to take personal video and photographs while enjoying your visit! All photographs must be taken in public guest areas or within spaces designated for special events, programs, etc. The Central Florida Zoo & Botanical Gardens has the right to withdraw consent of use for any photograph or video and to reproduce photographs taken on grounds. Don’t forget to use #CentralFloridaZoo when posting!